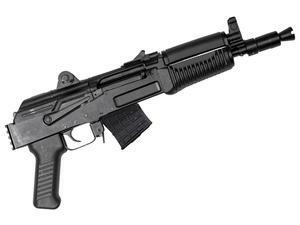 Arsenal's Bulgarian made SAM7K pistol now features a picatinny rail for rear attachments. Arsenal's exclusive milled receiver is made from hot-die hammer forged receivers. This process produces stronger and finer grained steel, compared to machined bar stock. Additionally, the SAM7K receiver requires over 5.5 hours of milling time before assembly. While the process is very complex and time intensive, the end result delivers a precision product with exceptional strength. Includes QD sling swivel, scope rail and 5 round magazine.